Adolf Galland, Werner Molders, Erich Hartmann, Gordon Gollob, and possibly the best of them, Hans Joachim Marseille, are all here. All of the above, and nine more fighter pilots, were awarded the Knight's Cross with Oak Leaves, Swords, and Diamonds (Brillanten). Many other pilots are in the book also. Gunther Rall was the greatest deflection shooter in the Luftwaffe (deflection shooting is shooting where the enemy will be, instead of from straight behind etc). This book shows the titanic struggle in the air over the East front. It also shows the almost suicidal courage of the Luftwaffe pilots when they flew against the massive bomber streams in the west. The book is 200 pages long, and it has twenty-four pages of black and white photos of the pilots and war. Some of these are posed propaganda pictures, but most are candid shots from the pilots' lives. The author does not get involved with the argument of the German fighter pilots' claims of 'kills'. He states his case in the introduction and then leaves the matter to the reader. If we take one fighter pilot and compare his 'kills' to his sorties, I believe it will clear up the issue. Erich 'bubi' Hartmann is credited with 352 'kills'. The number of sorties that he flew was 1,404. He was in air combat over 800 times. There were many instances where he notched up more than one 'kill' on a sortie. So roughly he is credited with one kill for every four sorties. The East front was an environment full of Soviet airplanes of all types. Also, as the writer points out, German fighter pilots flew until they were killed, wounded too much to fly, or the war ended. If the Allied pilots were given the same number of sorties and a rich target environment I believe they too would have tallied up impressive scores. Mr. Jacobs was in the Royal Air Force for over thirty years. So if anyone is qualified to write this book, it is him. He manages to tell the story of the war, and weave in the different pilots' lives and actions into it. It is true they fought for a horrible cause, but many of the people we history lovers read about would be listed in that way also. I congratulate Mr. Jacobs for this excellent volume on the German Jagdflieger. It is a great book for the novice and the expert alike on German WW II fighter pilots. The book not only describes the day fighters, but also the Reich's night fighters.As the author points out, many of these men were in their very early twenties when the war took place. At the same time that many people are just finding their way in the world, these men were in a life and death struggle with other young men and women (at least on the Soviet side). The appendices list the top scorers and their medals. 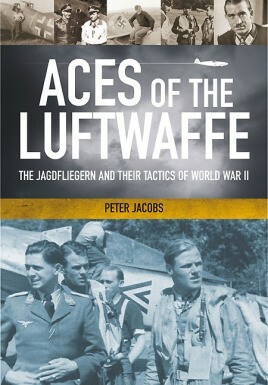 Great book, I have been reading it and it gives a good look on the task to show what made the luftwaffe pilots great and the luftwaffe strategic bad.